EspañolRobert Carmona Borjas, a Venezuelan dissident based in Washington DC and CEO of the Arcadia Foundation, became notorious in Honduras after he exposed the Latin Node bribery case in 2008, when Manuel Zelaya Rosales still served as the country’s president. A lawyer with democratic convictions and expertise in military and security issues, Carmona has become a leading political voice in Honduras, and one of the strongest opponents of Zelaya, now president of the socialist Freedom and Refoundation Party (Libre). In an exclusive interview with the PanAm Post, Carmona Borjas detailed the accusations put forward by the Arcadia Foundation against members of the party presided by Zelaya. He alleges links between the former president and the Revolutionary Armed Forces of Colombia (FARC), and points out the danger represented by Venezuelan President Nicolás Maduro’s influence on the Central American nation. What do you think of Manuel Zelaya’s path to chairman of the Libre party? The political crisis that Honduras experienced in 2009 was only a symptom of the crisis in moral and ethical behavior that ate the country from the inside, with rampant corruption that extended throughout the Manuel Zelaya Rosales administration. 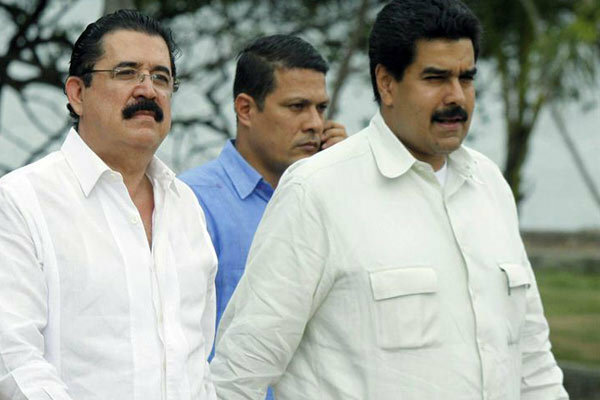 It has been nearly six years since that nightmare, and Zelaya still applies a permanent double discourse, which he orders the other members of the Libre party to observe as well. It goes one way when it favors them, and another way when it causes harm to others. The Libre party’s current policy is very clear: it bases its strategy on assuming that the country is divided into two sides. Then it promotes permanent confrontation. Respect for the sovereign Honduran people has been left behind by Mr. Zelaya’s henchmen, who make up the Libre party caucus in the National Congress. You have mentioned in the past that former president Zelaya received US$300 million from Hugo Chávez to finance his referendum on reelection called the “fourth ballot box.” Do you have evidence to confirm this? Those who know my experience in Honduras know well that I never use any adjective I cannot prove. That is why I could name the crimes of each one of the members of the caucus whom I call criminals. Since we began our fight against corruption in that country in late 2005, there has not been a single fact shared by us at the Arcadia Foundation that we haven’t been able to prove, or that hasn’t been proved correct. This was open Venezuelan interference in the internal affairs of Honduras, similar to what Caracas complains of today when other countries comment on human-rights violations in Venezuela. Today, that financial support from Venezuela to Mr. Zelaya and his followers’ aspirations to return to power is still present. You only need to observe the behavior of those who make up the Libre party caucus in Congress: they wear red, they deliver the same speeches, they create confrontation and division among Hondurans. That’s part of the same script that was created and introduced in Havana, and that has been spread thanks to Venezuela’s money, which is why we see it in Nicaragua, Bolivia, Ecuador; all those countries that are satellites of this robolución — this revolution of theft. How could this funding be countered? I urge the Honduran Congress to strengthen existing campaign-finance laws in order to have greater oversight. Funds will be definitely funneled there, coming from the Venezuelan taxpayers’ pockets — because it certainly doesn’t come out of dictator Nicolás Maduro’s personal wealth; that’s our money. Today we’re already seeing how the Venezuelan government is handing out money to Zelaya’s movement. The support is not only cash, it includes backing from Venezuela’s media apparatus, like the state-funded news corporation Telesur that falsely presents Zelaya as a legitimate leader. All of that implies a large economic investment. Another way the Venezuelan government operates is through private contractors who get awarded big public works. These private firms in turn donate to those parties. That’s how Nicaraguan President Daniel Ortega financed his campaign. Does Zelaya and his political movement pose a national security risk? Mr. Zelaya has ties to the terrorist FARC. The nature of those relations, that one way or the other are tied to Venezuela, are issues that should worry all Honduras. They should be regarded with a lot of caution and seriousness, because a deep investigation should be conducted to determine the extent of their relations with the guerrilla group. What exactly do these relations consist of? I cannot give you details about it at the moment because it’s an ongoing investigation, and the evidence is still being examined by the authorities, so I must excuse myself. What do you have to say about Zelaya’s threats to file lawsuits against you? I’m open to debating here in the United States every single case of corruption, abuse of power, FARC ties, defamation, insults, extortion, and homicides these individuals could have taken part in, starting with Mr. Zelaya himself. Do you have anything to say to the Honduran people, given that the Libre party you’re accusing of wrongdoing is now the second political force? The Honduran people must not let themselves be fooled. They should have a good look at the man who claims to side with the people and fight corruption but who lives in unjustifiable luxury, or those who hand out money to the people so they show their support. If they have to pay, it’s because they don’t have genuine support. Hondurans must be vigilant and unmask them. Translated by Rebeca Morla and Daniel Duarte.